I am not a pink type of person when it comes to clothing or accessories or decor. I actually don’t think I own anything that is pink. It’s not that I dislike pink it’s just that it’s not a colour I am naturally drawn to – unless it occurs outside my front door. I think he must have been walking around my neighbourhood when he said it. Everywhere I go flowers are smiling at me. With Spring casting her fairy glow on the streets I have been well and truly pinkified. Isn’t Spring wonderful with all the lovely colours in the gardens, seems to bring everything back to life again. I don’t mind pink at all, but it doesn’t seem to suit me in clothing, unless it is only a tiny bit of pink mixed in with another colour. I don’t suit pink either, Mags. Just my colouring, I think. The pinks in the gardens are stunning at the moment. A visual feast! Together we are colouring the planet in our pinks, oranges and golds. How pretty is that? Love it! Thanks, Susannah. I couldn’t resist the pinks. I am totally pinkified! I used to think that pink definitely wasn’t my colour, then I bought a grey sweater with thin pink stripes, which has become one of my favourites. A lot of men wear pink now – you wouldn’t have seen it years ago, would you? I see a lot of the office guys in the city wearing pink ties and shirts. It really suits some of them. Grey and pink is a nice combo! 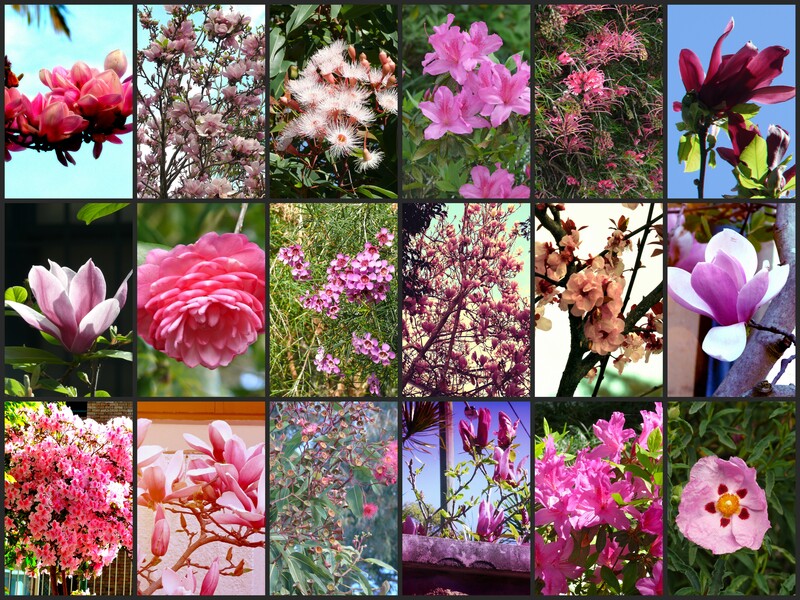 think pink (I love pink 🙂 ) beautiful photo collage Selma – I must take some more close-ups of flowers. I can’t resist flowers. It sounds silly but they speak to me. How glorious it must be to be that colour! I think pink is most beautiful in flowers. hope you’re enjoying spring as we are leaning toward autumn here in NY. I agree – it is beautiful in flowers. Spring is lovely here. Hope your autumn is gorgeous. Looking forward to seeing some pics! It’s funny, isn’t it? I’m the same. Nothing makes me say OOOh like a lot of pink flowers! Even here. Spring has seriously sprung. Of course most of our flowers here in Bots go subtle, whites, purples, cream, but things are looking lovely. Now all we need is a bit of rain. Whites, purples and cream would be gorgeous. We need some rain too. I am starting to worry about how dry the summer is going to be. Hope it rains soon. It is, isn’t it? It has crept in. It’s like a great big birthday present! Ah! And here in Massachusetts it is autumn in the air, the colors not quite yet turning, still the last of the greens. Thanks for the reminder of our opposite seasons. It’s quite amazing. It always makes me do a double take when I realise that on the other side of the world you are experiencing opposite seasons to us. It really IS a big, wide world! Gorgeous, glorious, but I have never worn pink! I admire it from afar only. I admire it from afar too, Adeeyoyo. It is very glam and gorgeous!